In celebration of the Year of the Ox, I am having the BIGGEST blog contest for 2009. The contest which is titled, “Big Mak Blog Contest” will have a total of $200 cash prize, 108,000 EC credits, tons of ad spots, Blogging from Home book from Janette Toral and one year of domain hosting. 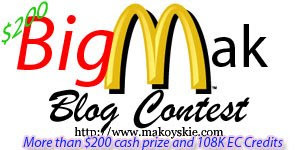 You have 12 options to earn points and raffle entries in the Big Mak Blog Contest. You can choose any of the 12 options or do all. BTW, anyone who has a blog can join especially the sponsors. If you are joining, #1 is required. If you just post the contest badge and Twitter, that is not counted. WHO WILL WIN AND WHAT ARE THE PRIZES? Winners for the first five grand prizes will be determined by points. The first five bloggers who have the highest points will win. Winners of the five grand prize are not eligible for the consolation and special prize. Consolation prizes will be selected in random using random.org. 12. Make a vlog entry in your blog answering this question: What "something big" are you expecting this 2009? (5 points) Say something about the contest and indicate the URL. Vlog should run from 30 seconds to 1 minute. The contest will start on February 6, 2009 and will end on March 15, 2009 11:59 P.M. (Singapore Time). Winners will be announced on March 20, 2009. For the cash prize, I will be sending it personally to the winner’s PayPal account. For the EC credits, ad spots, domain hosting and the Blogging from Home book, kindly contact the sponsor directly. Once again, thank you to all sponsors and thank you in advance to those who will join. I have also tweeted this contest on Twitter. Have Stumbled it and Dugg it. Good luck to your contest! 5. 2x12=24 points (some cash sponsors don't have email subscription). Greeting Sir Makoy, would it just be fine if a sponsor would join your contest? And if its fine, could it be possible to have all my blogs entries points fall under one name? yup sponsors can also join. just indicate the name and the URL if you have a multiple blogs. Just subscribe to all your 4 blogs under my username: astig316. I have also twitter the contest, fave al your 4 blogs at technorati, digg and stumble upon a couple of your posts. will posts comments and go through all your "how-to-earn-points" scheme in the days to come. Thanks for coming out of such promo! thanks astig316 for being the buena mano contestant :) good luck to everyone. i just realized how toxic it would be for me to tally points each day. I^'m wondering.. If I make 250 "QUALITY" comments, will I have 500 points? Just a question because it is stated in option 6 to have 2 points "each"? By the way, I joined now, for the meantime, I have 4 points by posting the "something big" and "the badge" in HERE. Wish all the best with this Big Mak Contest. Got you also followed with Twitter. Hoping for the success of your contest. got your badge included in my post as well with my sponsor part. diba yan magagawa kayu multiple na blogs nyu..
ilan kaya points ko dine? Entries regardless of points and randomly selected? Max points and first come first serve? Pool entries with Max points and randomly select? @pinoyism: it is clearly stated on the mechanics. Yay bakit wala ako sa list of sponosors? hehe. Anyways, all the best sa lahat ng participants and to your contest! thanks ambo! my total cash prize now is $190! ano po ba ito bawat isang blog na nareview ipopost ng magkaibnag post or magkasama sa isang post. hi rose! thanks for the query. it can be 1 post with the review for the 4 blogs. it can be 4 posts with a review for 1 blog. it depends on you. thanks! fave makoy's 4 blogs in technorati = http://technorati.com/faves/Rosa23?show=blogs = 12 points. Your post have Stumbled it and Dugg it. Please let me know if i done something wrong.. :-) thanks. hi rosa! one unique email is counted as one. thanks! Wow it looks to be a tough competition, really good job sir makoy. I'll try my best into it. Though the pointing system will be tough for me, i'll would still give my best. Two thumbs up for you sir mak. Thank you, trying all my best. I am taking part :) but please let me take time to do it. I forgot to tell you your tweet sentence is too long so I shorten it. I have subcribed to your other 3 blogs too. by the way, are you going to count the points for participants or we have to count it ourselves? added the banner in the post and side bar. THe contest post has the mechanic and sponsors as well. not sure how many points now. I have blog at http://anothercontest.blogspot.com/2009/02/big-mak-blog-contest.html with mechanic in post and banner in post as well. Side bar has banner too. with banner in post and banner at side bar. Also mechanic in post and sponsors on the list. pls let me know how many pts I have got. -Blog post with question answered, badge, and prizes: http://entersweepstakes.today.com/2009/02/09/bigmak-blog-contest-200-cash-and-108k-ec-credits/. -Following you on Twitter and tweeted about the giveaway: http://twitter.com/sweepstakesgirl. -Put your badge on my sidebar: http://entersweepstakes.today.com/. Thanks for the invite, Makoy. But I don't think I can join since I am not an Entrecard member. By the way, I am very sorry as I have accidentally deleted your comment on my blog post. This is because I am receiving tons of spam comments, and I think I overlooked your comment. Anyway, good luck to your contest. @makoy good to see there is code to copy. :) well will take time to blog the contest. 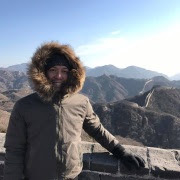 I just subscribed to pinayjade.com using sherrygo at ymail dot com. Blog posts: http://stilldoll.cn/archives/411, http://contestluv.blogspot.com/2009/02/big-mak.html, http://suki-desu.net/archives/654. Subscribed using x(at)stilldoll.cn, chie(at)suki-desu.net, and kawachiru(at)gmail.com. with mechanic, banner in post, sponsors on the list. I hope you are keep track on my entries. Hi sherry. Once the comment is showing here, I have tabulated the points already. thanks for joining! can update me how many pts I got? i just followed you at twitter and updated the post re increase on pot money as you requested. good luck on this one. It's making quite a buzz now! WOW! I envy with you, interesting lahat nang post mo. I wish ganyan din ako.. Contest is getting hot eh! If I would hold some contests someday, this would be my model. Dugg this post as “webbieladycont” username in digg with this comment, “Join in now! Big winnings!”. Subscribed through email in your four (4) listed blogs using the email address webbielady.cont2008@gmail.com and subsequently verified it. Subscribed through email in your four (4) listed blogs using the email address webbielady.cont2009@gmail.com and subsequently verified it. Subscribed through email in your four (4) listed blogs using the email address webbielady.cont@gmail.com and subsequently verified it. Wow Makoy! I just realized how hectic this contest is. I hope that even if I cannot comply we can still be friends. :-) I'll still keep coming by your blog. If my addition is correct I have 41 points so far. of Makoy's Memoirs of A Certified Blogger. Webbie, for you question about the email subscription. if you subscribed to 4 of my blogs using 1 email. makoy, kelangan b i-dugg ko lahat ng post mo? meron b points yun, each dugg? How can I join this contest? yay Makoy, I earn get referral pts right? and VLOG entry for the answering " what big are you expecting this 2009? Thank you for the information regarding subscription. I counted all as 24 (instead of 36 points) thus I must add 12 to my tally. Thanks a lot. yay Jes and Pinaymama joined this contest. Wow great prizes here. I want to join soon. got the post up on my site! placed the contest badge in my sidebar. Hey guys!!! Keep up the great work! Watch out for a contest in my blog Life of Filipina Blogger in March ;)! I have some questions to ask from you. I have 5 blogs and I want to participate your fabulous contest. How can I earn points? Do I need to add all my blogs to have it right or what. Do I have to submit one blog entry or to combine the points earned of my 4 blogs. Please let me know what to do so that I can start doing it. Thank you. Please leave your message as soon as you read this to my blog at Joro Livelihood. I will be back for more. I'm so busy lately that I cant post this contest and thanks for your email. thank you ! Good Luck to all! we are all big in joining this big contest. am working on the other optionals. all the best. will work on the others later. time for my thai foot and body massage!